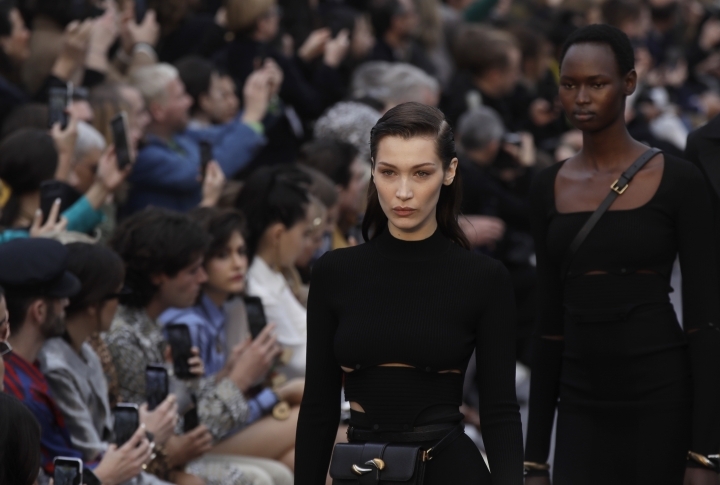 MILAN — Color was the watch word on the fourth day Saturday of the mostly womenswear collections during Milan Fashion Week. 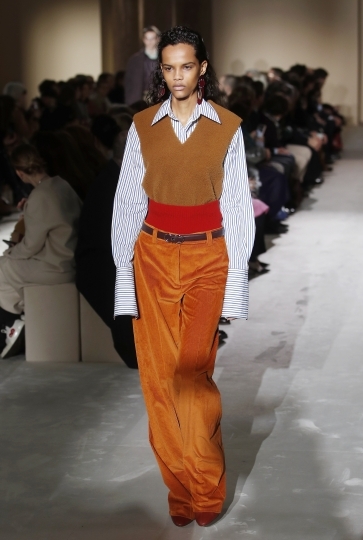 The Salvatore Ferragamo and Roberto Cavalli fashion houses each set off neutrals with bursts of hues while combining their women's and men's previews for Fall/Winter 2019-20. Ferragamo's color palette ranged from a peacock blue to an icy sage, mauve with forest green, while the Cavalli collection turned on a melange of turquoise, magenta, ochre, saffron and sky blue. 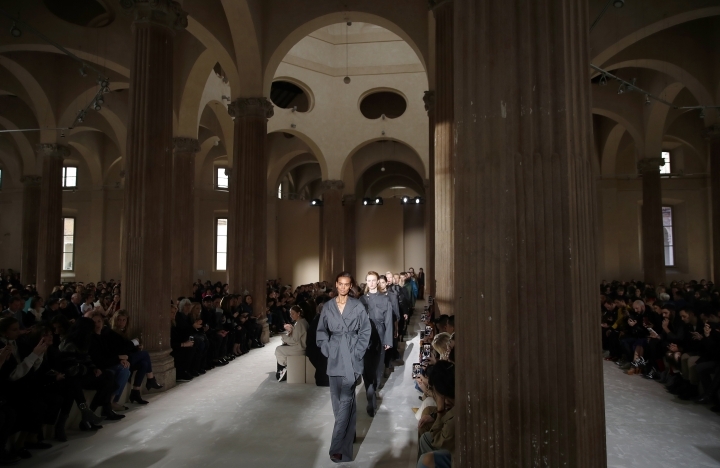 Another trend on Milan runways this season: including older models, a sign that fashion houses are taking their laser focus off millennials and returning it to a significant luxury demographic. Salvatore Ferragamo's latest collection drew inspiration from the brand's heritage with sculpted heels on footwear, a fresh emphasis on leather ready-to-wear and lots of color, combining innovation and craftsmanship to create a modern vibe. 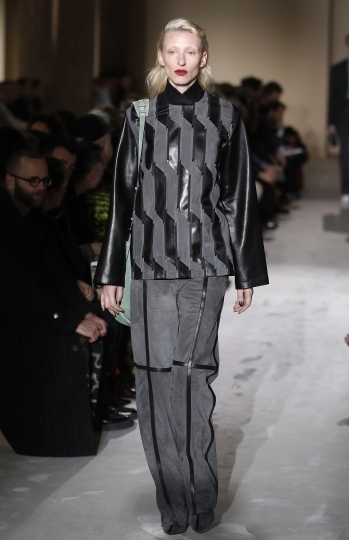 The combined womenswear and menswear collections included leather apparel for day and night, stretching beyond overcoats and footwear. That included long leather skirts with a pretty slit, a long black leather evening gown and a leather jumpsuit, as well as sportier suits for him and for her. 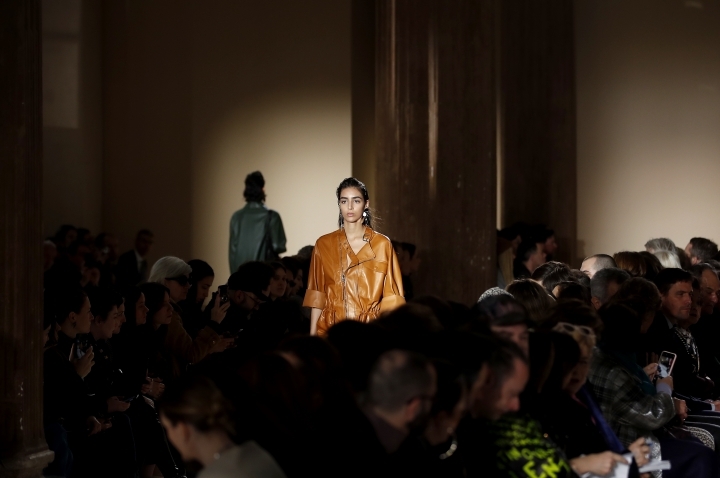 "Being a luxury heritage brand, I feel like we should own leather dressing," said Ferragamo creative director Paul Andrew. A Nappa leather puffer coat that had the sheen of technical fabric in a luxurious chocolate brown summed up the collection's innovation. "You pick it up and it's lightweight. It's built in a way that you can just sort of scrunch it up into nothing," Andrew said. The brand's signature footwear included a remastered sculpted heel inspired by a 1968 design by Fiamma Ferragama for women and rugged Nubuck trekking boots for men. Andrew included older models on the runway because "they really epitomize the woman that I am going after. In fact, Ferragamo is not dressing 17-year-old girls only. We also have clients who are 30, 40, 50, 60, 70." Andrew, who joined Ferragamo in 2016 as shoe designer then added womenswear, was named this week as creative director for the fashion house. He will continue the collaboration Guillaume Meilland, head of menswear, with both working across the segments for a complete vision. Creative director Paul Surridge's opening look for Roberto Cavalli was a print with the power and shades of an Arizona sunset, giving the brand's heritage animal print designs a fresh new twist and planting color at the center of the new collection. The collection offered women and men a sense of freedom in both movement and dressing. A pleated mini-dress billowed into evening length in the back, while knit dresses echoed the silkier pleating, projecting a contemporary silhouette with stronger shoulders and narrow bodice. Standout pieces included dresses decorated with shells and studs to create a rich pattern and snug, beaded art-deco evening dresses with cut-outs to reveal an under-layer that Surridge said was meant to be suggestive of a body tattoo. 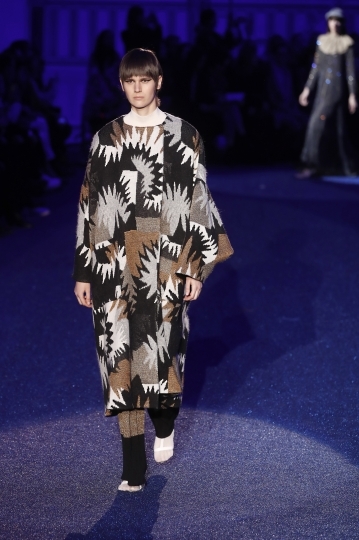 Coats for men featured exaggerated buttons and closures, while suits were dressed up with colorful patterned turtlenecks under suit jackets and shirts. For younger dressers, there were ski vests over big animal-print anoraks and matching tops, with the brand's new Vortex sneaker. "It's about pushing boundaries. 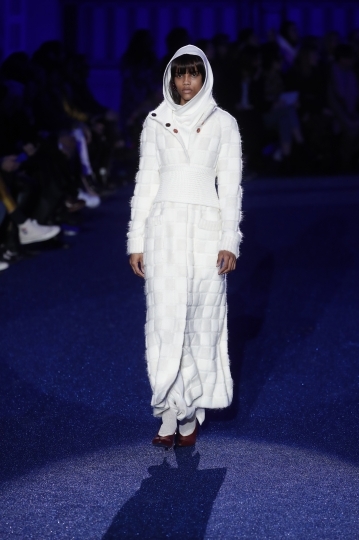 You have to be inclusive, not only on body shape but also age, and offering modern solutions for day, evening and cocktail," Surridge said backstage. 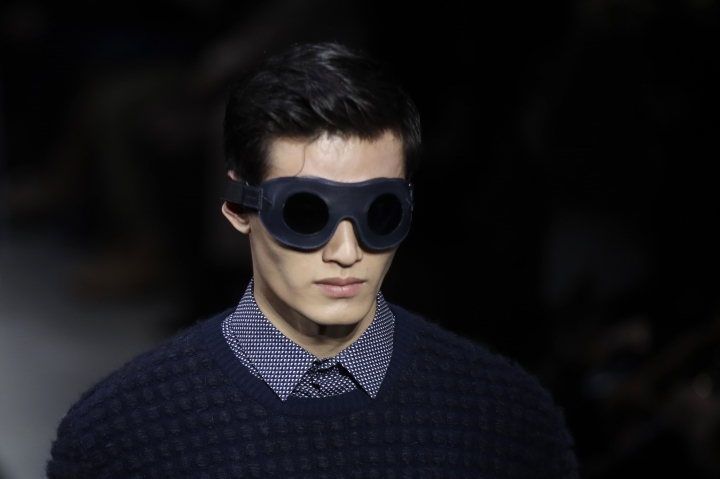 Giorgio Armani cast blue accents over his elegant collection for next fall and winter, with sculpted details recalling roses, or mini-cyclones. 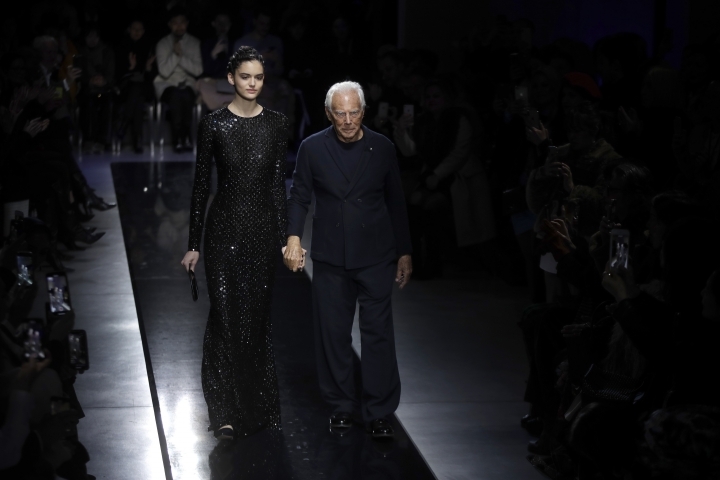 Armani held the combined women's and men's preview for the first time in his Silos museum, which collects and encapsulates the designer's creations. 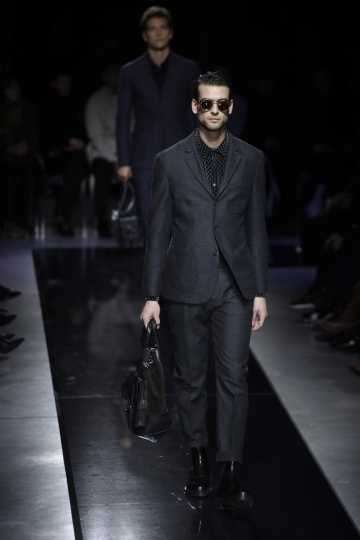 The female silhouette was elongated, accentuating curves, while the looks for men were strong and classic. Together they cut an elegant, evening figure. In fact, the collection shown under twilight lighting contained no strictly daytime looks. For women, dark suits featured short jackets with woven ribbon details in contrasting midnight blue and pants with a jodhpur profile. Long evening coats had sculpted necks. Belts and handbags both had ruffles that gave voluminous accent to the looks. An iridescent rose appeared on a top. The fronts of jackets were constructed to resemble a rose petal. Velvet pantsuits sparkled. Beyond the classic suits with slim fitting pants and structured jackets, men could choose from a loose velvet coat over a satiny shirt for a more indulgent, relaxed silhouette. 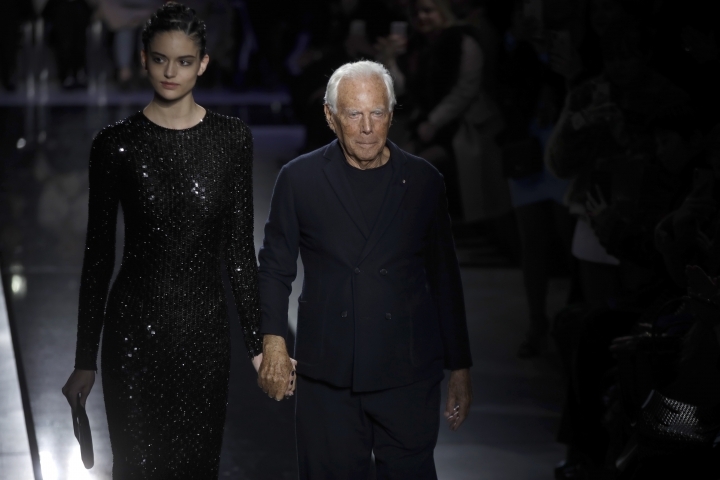 Armani called the men's and women's collections "complementary expressions of the same vision, united through the color blue." 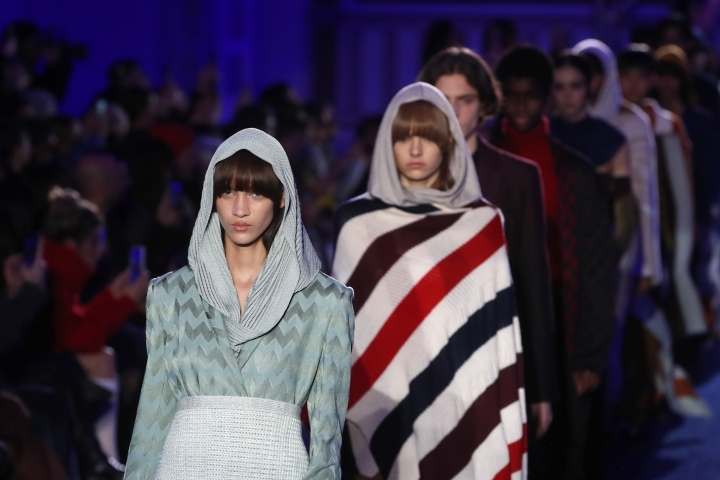 Womenswear was heavily accessorized by the family-run brand's own woven accents. There were dainty knit collars, often with a sparkle and slightly gathered, detached sleeves to accompany sleeveless tops, dickies that sometimes were long enough to be scarves, and hoods, ubiquitous hoods, that were less sporty and more for an elegant head cover. Knit belts cinched at the waist gave shape to open sweaters or dresses. Wraps were long and enveloping, often over finely knit pantsuits or pencil skirts. Jumpsuits cast a youthful silhouette. Looks were finished with rolled beanies. 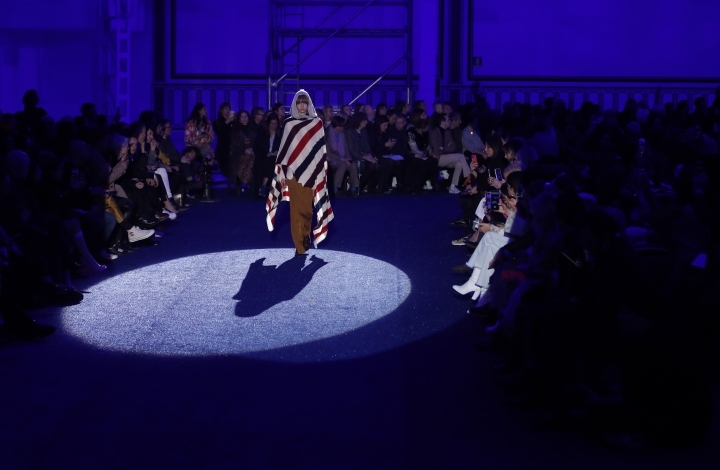 Menswear was relaxed, with robe-like outerwear over striped knits and easy trousers. A sparkly men's sweater faded from twilight to deepest night, and was worn with a sparkly knit foulard. 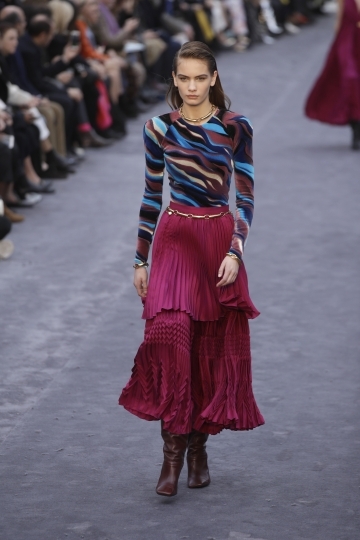 "The chroma allows everything to come back," creative director Angela Missoni said in notes. "As such, it shows no nostalgia."